Wine & Music & more! 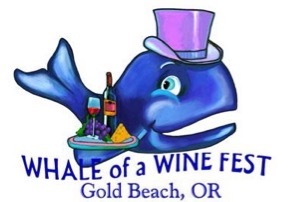 Whether your interest is fine wine tasting, experiencing gourmet treats or gazing out over the majestic Pacific Ocean, the Curry Fair Friends/Gold Beach Chamber of Commerce’s 32nd Annual Whale of a Wine Festival is the place to be. This year’s event will once again be held at the Event Center on the Beach in Gold Beach, just a short walk away from one of Oregon’s finest beaches. This two-day event, scheduled for May 17 and 18 promises to be the event of the year. One you won’t want to miss. You may need all that time to fully experience everything the venue has to offer. Come early and take your time visiting with each winery representative. They all have fascinating histories and stories to tell. After tasting, grab your favorite glass of wine or brew and browse through the many vendors sharing with you their talent in their products offered by some of the finest artists in the region. And don’t worry about whatever weather that will come for this two-day event because we will have the courtyard covered by a large event tent complete with sides and heaters. Admission includes a wine glass (if you are one of the first 300 attendees) and a complimentary wine tasting. Friday hours are 4:00 p.m. through 8:00 p.m. and Saturday hours are 11:00 a.m. through 8:00 p.m. Tickets are $15 which is good for both days. Whether you’re traveling from out of town or live close by, treat yourself to a night at one of Gold Beach’s finest lodging establishments. This year’s event will be one to remember and you won’t want to miss it. Come and spend a fabulous weekend of fine wine in beautiful Gold Beach, Oregon. Can we buy tickets now? Do you offer any deals for large groups or bachelorette party? Please call Ron Crook at the Event Center. 541-247-4541, he shoudl be able to answer your questions. This is awesome but if held during the summer tourist months would be a better turnout!!! We live in Brookings and the problem here is there isn’t enough to do once tourists get here….wine fest would be a great addition to summer fun!! Thanks for your comments, we try to do this in the off season to bring folks to the area. Hope to see you there! My band played last year. Wendy and The Lost Boys will perform at the 2017 Festival. See you all there! We are glass artists interested in maybe applying to your festival. Just a few questions. Could you please call me at 541-935-7956. Please call Ron Crook at the Event Center, he will be able to answer your questions. 541-247-4541. Thanks, sorry for the late response. Do not forget the great food to eat there. What?!? Thirty years?!? That can’t be. I was there for the 1st, 2nd, 3rd and 4th years, so I can’t miss the 30th!